The most relevant moment in James Orlowski’s climate change documentary “Chasing Ice” is shown within the first two minutes. Clips of Hurricane Irene sweeping houses off their foundations flit across the screen, juxtaposed against the voice of Sean Hannity screaming about the illegitimacy of climate change. In the wake of Hurricane Harvey and Irma, and President Trump’s subsequent ineffectual response, “Chasing Ice” feels particularly prophetic and more relevant than ever. Orlowski’s film follows the journey of photographer James Balog as he attempts to capture glacial melting in Greenland, Iceland, Montana, and Alaska as part of the Extreme Ice Survey, a study which seeks to catalog and publicize effects of climate change. 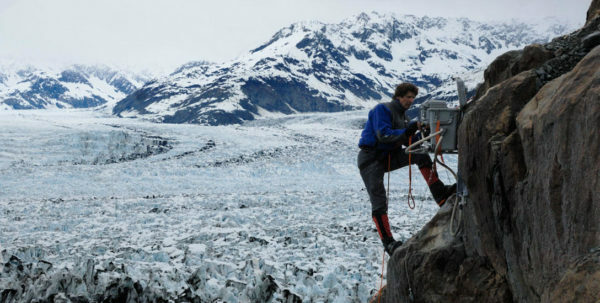 Balog uses a series of advanced time lapse camera installations to track the conditions of glaciers over the course of three years time. In addition to its poignant commentary, Orlowski’s film is aesthetically beautiful in its display of ethereal glaciers and the magnificence of the most remote places on the globe. “Chasing Ice” provides a stunning visual guide to the effects of climate change, making it both a dazzling natural display of entertainment as well as a chilling treatise on the dire effects humans are having on the environment. During the course of the hour and fifteen minute film, Balog pauses as he is asked why he chose to photograph glaciers over other climate change subjects. “Glaciers,” Balog says carefully, “are the canary in the global coal mine.” Climate change is difficult to photograph. It is contested, Balog believes, because it is too conceptual for the public to understand. Glaciers, on the other hand, are visual and beautiful. Ice is sculptural, architectural, and ripe to be photographed. By documenting this kind of evidence, Balog presents a more visceral and engaging argument for climate change to his audience. In my opinion, the visual aspect of the film was the most stunning. The glaciers themselves resembled the surface of the moon — alien, glistening, dotted with holes and craters, dusted around the edges with carbon and algae. There is something so impactful about witnessing the majesty of nature. Many of us have felt it at some point in our lives — whether it’s the view from the top of a mountain after finally reaching the peak or the beauty of seeing a plant grow after tending to it, nature constantly amazes us. Coupling the stunning beauty of glaciers with the blunt knowledge that we are destroying them makes Balog’s film all the more persuasive. Toward the end of the film, Balog and his team stop to photograph a massive glacier that has a giant crevice running down the middle. They stare down an abyss hundreds of feet deep, only inches from the edge. This scene conveys the absolute paradox of global warming: We as humans are completely dwarfed by aspects of nature like glaciers, yet we somehow have stumbled upon a way to completely decimate them. The shock of natural events that have occurred recently, from hurricanes to wildfires, to tropical storms and inhospitable temperatures, remind us of the danger of this paradox. Glaciers the size of the empire state building have been obliterated, water levels have risen by half a foot and natural disasters cost us trillions of dollars in funding every year. As right-wing pundits and talking heads fixate on the minuscule amount of scientists who disagree with the idea that there is anthropogenic climate change, Balog takes his team into places where we can systematically, categorically document climate change. We know what is going on with our environment, and it is up to us play our role in disseminating knowledge and making change. Contact Natalie Sada at nsada ‘at’ stanford.edu.